Today Donna and I navigated our way by boat, car, multiple minivans, and a ferry to Koh Chang Island, Thailand. Donna has done an amazing job finding cool places for us to stay. We are are at a guesthouse that is on an estuary sitting on stilts allowing the tide to flow in and out beneath us and is surrounded by mangroves. The guesthouse has three rooms, each facing the river. Because there it’s the off season we each got our own room. There is a really cool deck for us to hangout and relax on. The deck is right in front of our rooms. This river flows out to the ocean just 100 yards down from us so we can walk to the beach. We also sit on the west side of the island so I am hoping for some amazing sunsets. Donna and I had a great dinner at this little backpackers shack up the road. We ate right in the beach and watched the sun go down. I had a yellow curry with rice. We then watched as nature painted before us in ways hard to capture with words. Here are my three favorite pictures. Let me know which one you like the best by leaving a comment below. Based on Facebook responses Crimson Twilight appears to be the overall favorite. It was awesome watching the colors change as nightfall progressed. There is something magical about being on the beach at sunset. The next day we decided to walk on the beach to find a breakfast place. Because it is the low season there are hardly any tourist. We ended up having the whole beach to ourselves. There is all kinds of life on the beach and beautiful shells for collecting. After breakfast we went to ride and play with elephants. 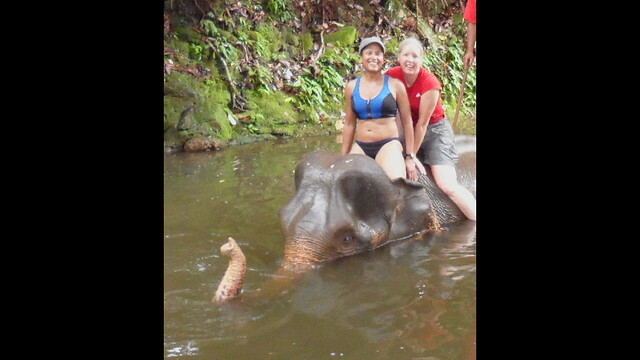 Neither of us had ever ridden an elephant through the jungle but what made this extra special was bathing them. I’m going to try to load some video but I don’t know how well this will work using my phone. After our day with the elephants we took a boat ride across the river to a Thai restaurant. We were both starving so we ordered a lot of food. The food was really good. We both love fried fish. I had fried sea bass and Donna had fried grouper. Today we contemplated what to do as we watched the rain pour down over the river from the deck of our guesthouse. We finally decided to go visit the spa across the river for massages. I love the fact that businesses will pick you up by automobile, boat, or in this case kayak. Both Donna and I decided to get foot massages. I also tagged on a neck/back massage. The while process took 2.5 hours and cost me less than $20. And, to top it off, it was the best massage I’ve ever had! Later that day we ate at a very good Thai place and Donna had her favorite mango sticky rice dessert. Tomorrow we are taking a Thai cooking class. I hope we learn to make some cool dishes. Don’t worry, I’ll post all about it tomorrow! Loved your pic’s. I like pic no 1. Your mom, Barb, and I are having a great time reviewing all your fantastic photos. I was particularly impressed with the massages. In the states that would easily have cost $200. And the beach sunsets are absolutely beautiful. Okay, my favorite sunset was the number one, I love the shimmer on the water and looked like the tip of the branch was dipping in to the sun. I loved loved the massage and price is so cheap. Food looked delicious. I am with Donna, mango with sticky rice is my favorite too. Teddy bear rice was too adorable to eat. Thank you for the pictures. One more thing. How was it to clean an elephant? Do they behave or did they soak you? Log in | 19 queries. 0.196 seconds.